WASHINGTON, D.C. - In cooperation with the U.S. Consumer Product Safety Commission (CPSC), Bath & Body Works Inc., of Columbus, Ohio, is voluntarily recalling about 1,000 ice shavers. The stainless steel blade on the shaver can cut consumers and cause injury. Bath & Body Works has received five reports of incidents, which caused minor injuries to consumers' hands and fingers. These incidents occurred at various Bath & Body Works stores. The recalled ice shavers are orange and blue, come with two ice maker cups, and have a palm tree design on the sides of the machine. 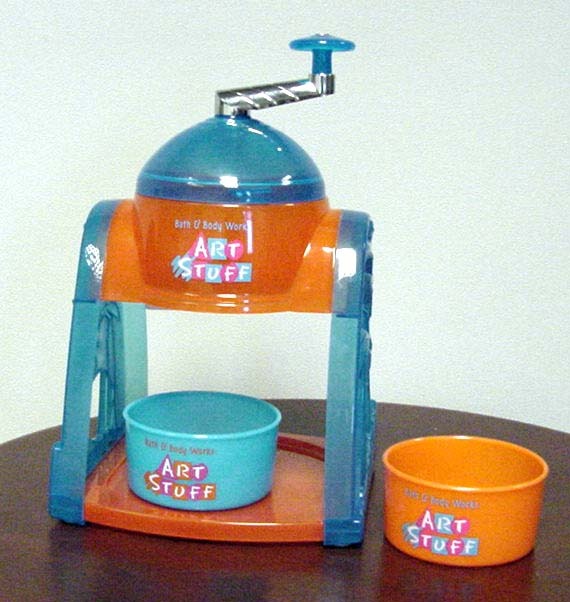 On the front of the ice shaver are the words, "Bath and Body Works Art Stuff." The ice shaver has a silver and blue handle, which when turned, compresses the ice onto a stainless steel blade. On the bottom are the ice shaver are the words, "Made in Taiwan." Bath & Body Works retail stores sold the ice shavers nationwide throughout May 2002 for about $20. Consumers should stop using these ice shavers immediately and return them to any Bath & Body Works store for a full refund or store credit. For additional information, consumers should call Bath & Body Works at (800) 395-1001 between 8:30 to 5:30 p.m. ET Monday through Friday.